"dBs .... " came the familiar voice of an ah beng early in the morning. 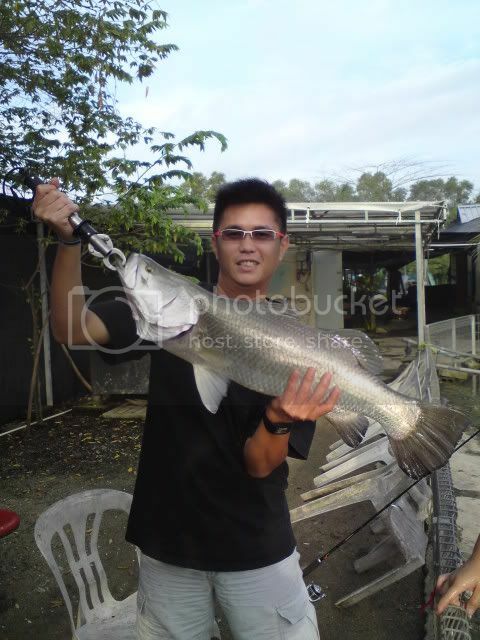 "I caught a big KBL ... and a bigger KBL !!! I landed a big meow meow ... very fun ! " Alright ... sleep tight now but when you wake up ... WE WANT TO SEE PICS PICS ! okok now shall post the pic for u guys to see but hor too lazy to write or lo soh. let the pic do the talking for me. 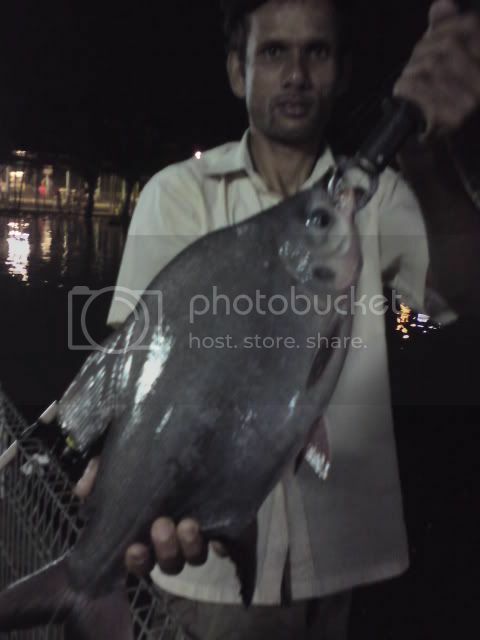 time pass veri fast, we was there ard 12am n fish till 9am, didnt koe tat fw3 fish feeding time is at 8.30am. to my surprise i saw yii came at 8am as he was on duty today. after seeing the bangala feeding the fish there are lots of fishes surface ard the pond of their food. so without anytime wasted i cast my bait to the spot where the bangala throw his food for the fish, after i had cast my bait to the spot less than 10secs tis KIM took my bait n go on zzzzzzzzzzzzzzzzzzzz....................wahahhahahahahhaha.....sibeh song ar........saw the KIm wit some aerobatic jump n finally the KIm was landed n pic was taken by yii. btw thanks yii for landing the fish for me. after feeding the food with tell keng, so now its time to feed the kitty. again bangala throw bread all over the pond n we can see kitty surface up for their morning breakfast, so i ask my kaki to cast as close to the bread tat flood on the surface. lastly when is abt time to go bk i try my last cast, hoping to get 1 of the kitty but iam not granted wit my wish, tis time round is GOALKEEPER tis damn huge kim which is more bigger than my 1st 1. same thing again my reel started to scream zzzzzzzzzzzzzzzz...............all the way fast n furious which i cant stop it. he dash all the way to the left hand side frm the place i stand, just to imform u guys there is a dunno wat thing at the left hand side of the pond which i find tat is very tin teh after fighting for few mins the kim n my line get stuck at the tin teh thing, but yii n all of us saw the huge kim close to us. in the end my hook gave way n the kim smile n wave at me BYE BYE see u next time. for tis there is no cr on the kim but yii can prove it cos he is oso there to help me solve the problem of bring up the kim since it was stuck at the tin teh thing. ok story end here, btw a reli big thanks to yii for trying all ways to help me bring up the kim, but too bad cant land it cos i think yii n his colik had tried all ways to help me, even yii colik when into the pond to help me to take up the kim but too bad still cant get it. 1 SUPER GOOD TIPS for those who wanna got FW3 to fish, MUST GO THERE BE4 8am n standby for the feeding time, iam veri sure u will not regret wit it. yii.......I WILL BE BK SOON.......once again thanks yii n yr colik, yii pls help me to said thank him for his n yr good service for us tis morning. The fishes there are sure very good size. I can't help noticing that particular kbl, it's really beautiful and shiny with all its fins nice and intact. Too bad about the kbl that got away, I guess your qouta for the day is up. Excellent catches nevertheless. bro arsenal..finally no Zero Fighter liao ! yeah ! 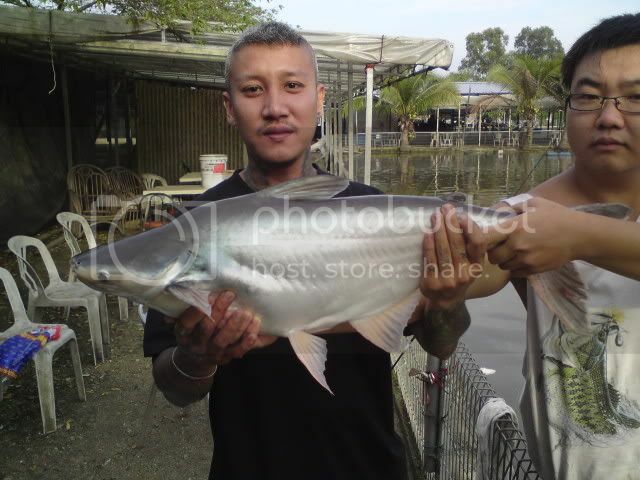 Peace wrote: The fishes there are sure very good size. I can't help noticing that particular kbl, it's really beautiful and shiny with all its fins nice and intact. Too bad about the kbl that got away, I guess your qouta for the day is up. Excellent catches nevertheless. domvonn wrote: bro arsenal..finally no Zero Fighter liao ! yeah ! rookie wrote: nbz, again bo jio!!! Agreed 100% with ahhhhhhhhhh beng! You ban from fishing till we know she is "fishing" again too. Congrats to your friend catch too ... finally got a taste of catfish. I for sure is like the big kitties there deep deep ...damn fun. Alright guys ... you all heard what Peacy said ... He wants the Kimmy Pic ! With nice nice upright fin and shiny shiny body ...alive and flipping ! My "son" how how ... mummy bring you go play big meow. Got yii to land fish for meeeeeeeeeeee! Alright guys ... how how ... this fri midnite till morning or Sat midnite till morning ? 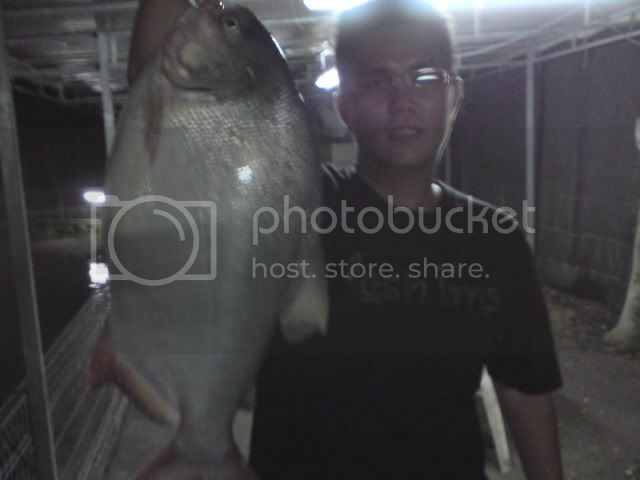 count me in, iam onz....but hor....fishing opposite side which we BBq tat day is a better spot. i have observe the air pump there, the pacu is the place they hide out as for the kitty is at the centre of the pond n for the KBL is at the TIN TEH thing there. sO u guys going to FW3 again ar?? when the feeding time reach, jus use bread can leh..
dBs™ wrote: My "son" how how ... mummy bring you go play big meow.